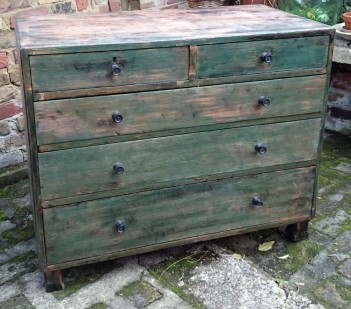 This chest of drawers is Victorian pine, and we found it with a thick black layer of something all over it. We took the belt sander to it and we were very surprised at what appeared. At some point in the past it had been stained green and then had had various different colours of paint and polished applied after. The finish you see is what revealed itself. We have left on the original knobs in their original condition and we have applied a a couple of coats of shellac to seal the finish. We think it would look great in an industrial or warehouse themed interior decor. This is item is not currently in the shop. Please phone or email us if you would like to see it.